On November 8, ANUTEC BRAZIL received the “Ambassadors of Curitiba” award, which recognizes the fair as one of the main events held in Curitiba in 2018, according to Curitiba Convention & Visitors Bureau (CCVB). The criterion for choosing the awardees are community engagement, legacy for the city and contribution to the local tourism development. 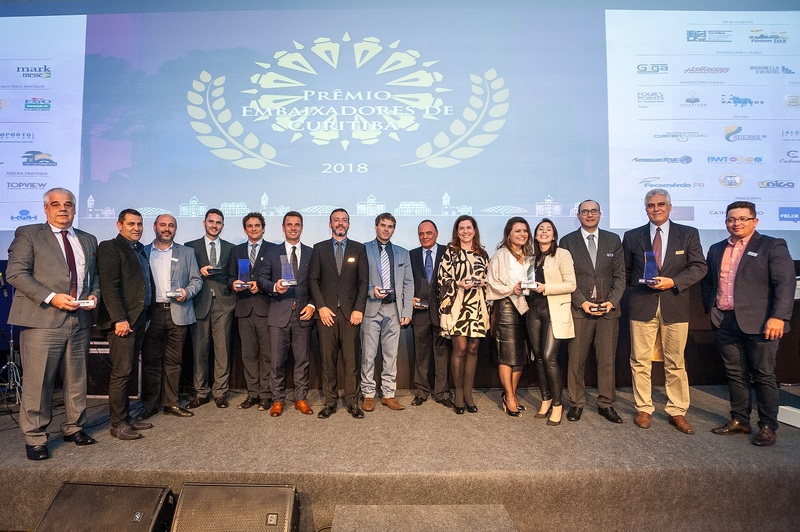 The award ceremony took place at an exclusive cocktail party for guests, in Curitiba, with the presence of the Managing Director of Koelnmesse Brazil, Cassiano Facchinetti, who was representing ANUTEC. “We are truly honoured to receive this award. The city of Curitiba is very important for ANUTEC BRAZIL. I must praise not only the infrastructure of the Expo Trade Center, but also of the surrounding areas as a whole regarding the reception of tourists. This is certainly a fundamental part of the success of our event”, says the executive. In the ceremony, 13 among more than 239 events held in the capital of Paraná during the year were honoured. “The event sector plays a fundamental role in the development of a purpose because, in addition to moving the economy, the trade fairs, conferences and symposia it brings knowledge as the main legacy, for example. We present this award ceremony every year as a way to thank the organisers, as they all, somehow, have transformed our city”, said Adonai Aires de Arruda Filho, president of CCVB. The next edition of ANUTEC BRAZIL, International supplier fair for the meat and protein industries, is scheduled for 26 – 28 May, 2020. The event gathers the key players from the packaging, processing, refrigeration, food safety, logistics, ingredients and services areas. Leading companies in the industry, such as Bettcher, Ulma Packaging, Handtmann, Tecmaes, Multivac and Polyclip have been participating since the first event and have already applied for the next show in 2020. The fair is already established in the animal protein industry calendar and has received visitors from different regions of Brazil and over ten countries, including Paraguay, Denmark, Venezuela, Chile, the United States, the Netherlands, Peru, Colombia, Mexico, Germany, Uruguay, and Nicaragua. The exhibitors appreciated the internationality of the visitors. More than 4,000 visitors are expected for the fourth trade fair in 2020. This includes companies from slaughterhouses, food and beverage industries, searching for the latest technology innovations within the industry. ANUTEC BRAZIL is inspired by Anuga FoodTec, which is the world’s largest industry event that happens every three years in Germany. Koelnmesse is an international leader in organising food fairs and events regarding food and beverage processing. Trade fairs such as Anuga, ISM and Anuga FoodTec are established world leaders. Koelnmesse not only organises food trade fairs in Cologne, Germany, but also in further growth markets around the globe, for example, in Brazil, China, Colombia, India, Italy, Japan, Thailand, the United States and the United Arab Emirates, which have different focuses and contents. These global activities enable us to offer our customers a network of events, which in turn grant access to different markets and thus create a basis for sustainable and stable international business.